I always think of Ezuri in the same breath as Conspiracy‘s Leovold and Edric, not because there’s anything really similar about them but rather because they are so different. Urban elves are an interesting twist you almost never see in fantasy, but Ezuri is about as archetypical for Magic’s elves as it’s possible to be. I mean, he literally casts Overrun when you get enough mana. Actually, in a sense he’s even better than Overrun, because mono-green decks can’t really play Reverberate, but they often have more than enough mana to use Rings of Brighthearth! He’s powerful enough for constructed, big enough for Commander, yet simultaneously small enough for Tiny Leaders – what’s not to like? I feel like Ezuri was the cherry on top after a long line of great elves. For awhile Elf tribal was very common in Standard. Lorwyn, Zendikar, and then Mirrodin were bountiful with great Elf cards. Elves excel at two things, mana ramp and token production. Fortunately Ezuri can take advantage of both. Being able to affordably protect your elves will help whether you’re on offence or defence. Both Garruk Wildspeaker and Kamhal, Fist of Krosa have taught me that a single Overrun can win the game, so imagine what multiple Overruns can do. 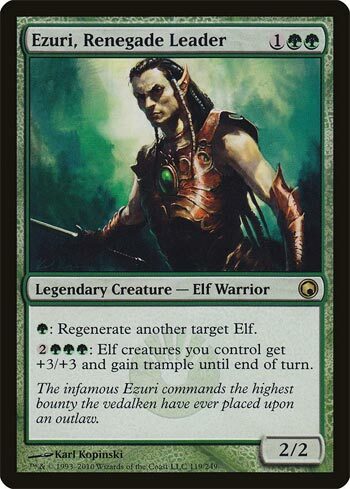 The king of the Elf decks in many formats, Ezuri is basically an alternate win condition to Craterhoof Behemoth (and is the more likely one to see Modern play). Five mana to enable an alpha strike is nuts, since this also buffs Ezuri, and he also actually fares well in smaller skirmishes with the ability to regenerate other Elf creatures on your board. He’s pretty straightforward: protect him, and run everyone over with a horde of pointy-eared nuisances. Being a 2/2 is not ideal, but since it’s possible to win on the turn you resolve him in an ideal board state, who really cares?